Bob and Clippy, Meet Pegman! Biofuels from bacteria - what could go wrong? The FBI has released the story of fraudulent activity in the El Cajon, California office of the California Division of Motor Vehicles. A driving school owner, in cooperation with a few DMV employees, was able to get anyone a California driver's license - for a price. This went on for three years, resulted in the fraudulent issuance of more than 100 driver's licenses, and netted over $50,000 for the ring. So how did it stop? When a new manager arrived at the El Cajon DMV office, however, “she instantly realized that something wasn’t right,” Peters said. The new manager alerted the DMV’s investigative arm, who in turn called the FBI. This raises a question - why didn't the old manager catch this? Was the old manager clueless, or was the old manager in on the scam? The FBI summary doesn't say. According to the FBI, the case is ongoing. I've found that my three posts on The Retail Equation are among the most popular posts on the Empoprise-BI business blog. If The Retail Equation ever provided services for KitchenAid, I auspect that my blog views would eclipse those of Arianna's little website. Once considered a cost of doing business, many retailers today are rethinking the return counter to make the shopping experience better for customers, which can have big benefits to the bottom line....[R]etailers can drive incremental sales through our product called Return Rewards®, which uses information about a consumer’s return transaction to instantly customize an offer for that particular person at the point of return. This provides an immediate incentive for the consumer to continue shopping at the store and for a specific product. Additional information on Return Rewards can be found here. The cable and satellite companies continue to use a dinosaur model that requires you to subscribe to a specific cable/satellite provider to get content from companies such as HBO. In the long term, however, this model will die because it is competing with the Internet, where everyone has access to the same content. [O]bviously people won't pay for these cable/satellite services any more. And at the same time, the content providers won't get all of that guaranteed revenue that has made them greedy. It's only a matter of time before this cable/satellite model keels over, right? In the history of my Jim Bakker-ish "I was wrong" moments, this has probably been the biggest "I was wrong" moment yet - and it only took me a couple of days to figure out how wrong I was. For those of you who missed it, two big stories emerged over the past few days. Timothy B. Lee summarized both of them - the ongoing negotiations between Cogent and Verizon, and the completed deal with Netflix and Comcast. In brief, Netflix (a customer of Cogent) accounts for a huge percentage of Internet traffic. For various reasons that Lee explains, this means that broadband companies such as Verizon and Comcast can try to demand money from Netflix (or Cogent) to carry Netflix's traffic. As of now, Verizon has not succeeded in getting money from Cogent - but Comcast has succeeded in getting money from Netflix. As this proceeds, there will be no effective difference between the current cable/satellite entertainment industry and the online broadband industry. For example, this month's current brouhaha in the former industry is DirecTV's refusal to carry The Weather Channel. Perhaps your response is to ignore DirecTV altogether and just go directly to weather.com. But what if weather.com has paid a fee to Verizon, and hasn't paid a fee to AT&T? If that is the result, then videos on weather.com may be degraded if you try to access the website from AT&T. And, of course, Jim Bakker's own website may be affected. Hmm. This is suddenly getting somewhat personal. Last week, Dr. Tom Sant of Hyde Park Partners gave a presentation to the California chapter of the Association of Proposal Management Professionals. In his presentation ("The Art and Science of Compelling Value"), Dr. Sant briefly mentioned Dr. Daniel Kahneman, a Nobel Prize winner for economics who doesn't happen to be an economist. One of Dr. Kahneman's concepts is that of "loss aversion." I was searching for some easy-to-understand examples of loss aversion, and I ran across three of them in a Cass Sunstein article that I found on LinkedIn. One approach was to offer a five-cent bonus to customers who brought reusable bags. More recently the District tried another approach, which is to impose a five-cent tax on those who ask for a grocery bag. This was very effective. As Sunstein comments, "Five cents is not a lot of money, but many people do not want to pay it." 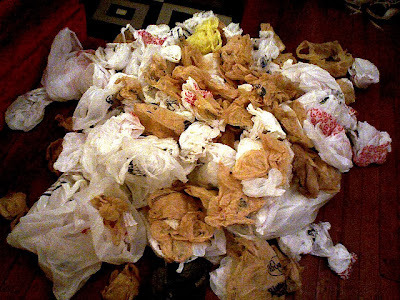 Carol Rucker notes that the fee resulted in a 50% reduction in disposable bag use in Washington, DC grocery stores. See Sunstein's other two examples here. Governor Andrew Cuomo last month earmarked $15 million in his state budget proposal for what he called “the nation’s first college dedicated solely to emergency preparedness and homeland security.” Cuomo announced plan during a presentation for Vice President Joe Biden in January, saying there would be “a need” for it. A spokesman for the state’s university system, SUNY, said Chancellor Nancy Zimpher supports Cuomo’s proposal. Assemblywoman Linda B. Rosenthal, chair of the Assembly’s Commission on Science and Technology, wrote a letter to Assembly Speaker Sheldon Silver advising Silver to reject Cuomo’s plan. “I cannot support this initiative until I have a better understanding of the proposal, its long-term cost and impact on existing programs,” she wrote. Rosenthal...noted in her letter that she was worried that the college would be competing with John Jay College of Criminal Justice, a school in her district. “I am concerned about how this college will be integrated with existing related programs at campuses around the State,” she wrote. So what does the John Jay College of Criminal Justice have to say about itself? Well, it won't be unique in its mission of the Governor and the State University of New York have their way. So we have the City University fighting with the State University - and that is how homeland security decisions are made. It seemed easy enough, but before I clicked that "Get Started" button, I figured that I'd better figure out what this Publish feature was. So I ended up reading John Hall's explanation. The initial reaction of some members may be to compare this feature to sharing a post with only their connections, as they’d been able to do in the past. However, there’s a huge difference between a friendly post and an actual article in terms of quality. LinkedIn is creating specific channels that will support targeted content for a variety of industries. As you build your platform, this will be a key way to stand out as an industry leader. If your features don’t get enough traction, this could prevent your platform from being as useful as it could be. I am fairly select in what I choose to share via LinkedIn's existing capabilities, confining myself to brief discussions specific to biometrics or proposals. While my...um, broader interests are certainly available on the web, I figure that people who are reading on LinkedIn don't particularly care about my thoughts on Bob Casale. At the appropriate time, I'll give this a spin and see what happens. We believe in giving our members access to the business knowledge they need to be great at what they do. To put that simply, we are making a commitment to our members: the time you spend on LinkedIn will make you better at your job today. Every professional has valuable experience to share. Trying to grow your business by reducing customer attrition? Read the post from Monica Adractas, head of customer retention at Box, on churning out churn. Just starting a career in sales? Read the post from Brent Beshore, the founder/CEO at adventur.es, on how to sell anything. Need a science-based planning tool for river restoration? Read the post from Glen Leverich, senior geomorphologist at Stillwater Sciences, on A Science-based Planning Approach for Riparian Restoration. Starting today, 25,000 members will have the ability to publish content on LinkedIn. We’ll be steadily expanding the capability to all members in multiple languages over the next few weeks and months to come. Check out our member help center for more information. P.P.S. I would have linked to LinkedIn's original press release, rather than Yahoo's version of it, but I couldn't find press releases on LinkedIn's page. Maybe you have to be a Premium member to find them. P.P.P.S. If you're interested in LinkedIn, be sure to read Jason Alba's blog. I've written about it before. For my non-U.S. readers, I should point out that National Public Radio serves the people of the United States. (Although I'm sure that if Slovenia has its own "National Public Radio," it's probably a quality organization.) And this story deals with American citizens abroad - or, more accurately, FORMER American citizens abroad. During the economic recession, lawmakers saw a chance to bring in massive sums of money and stop tax cheats at the same time. "They just found UBS in a terrible scheme to encourage tax evasion," Barney Frank, the Democratic congressman from Massachusetts, told NPR in 2009. "I think there are clearly tens of billions that can be recovered there." The next year, in 2010, Congress passed the Foreign Accounts Tax Compliance Act. The law affects every foreign bank that does business with the U.S. And not just banks: It also applies to retirement accounts, mutual funds, and more. NPR's Ari Shapiro points out that the United States is unusual in this regard. If a Spanish citizen is living in Canada, he or she is not required to pay taxes in Spain. But that's not the case for Americans living in a place such as Germany. Many of them decided to wash their hands of American account-holders. "They canceled the accounts of just about every American in Europe," says retiree John Mainwaring, "including me." But there were some Americans that decided to implement an even better solution to the American taxation problem. Now remember that most countries have higher tax rates than the United States. And if people feel that the American regulations are so onerous that they'd rather be a citizen of Europe, then those regulations must be onerous indeed. Although NPR and others have been discussing this over the past few days, it's been a topic for months. Oh, and if you decide to renounce your U.S. citizenship, your former government doesn't give you any parting gifts - it just puts your name on a list. Back in January, Amanda O'Brien wrote a piece entitled 5 reasons your business should have a blog. Unfortunately, there's the danger that some readers will conclude that all five reasons are of equal importance. Take her second reason, "boost website traffic and search rankings." It seems that so much of the online industry is centered upon boosting website traffic and search rankings. However, devoting ALL of your efforts to boosting website traffic and search rankings will result in...increased website traffic and search rankings. And that and two bucks will get you a cup of coffee - and, as Derek Muller of Veritasium notes, may actually end up DECREASING the reach of your content. As far as I'm concerned, the ONLY reason why your business should have a blog is the fifth and final reason that O'Brien lists. So what is that reason? Go to her post to find out. Most of our precious devices depend upon electrical power, and it is a constant challenge - even in the First World - to keep these devices charged all the time. Therefore, the University of Texas has designed a "micro-windmill" soluion. Now, before Jim Ulvog worries that these micro-windmills will serve as "slice-and-dice" machines for flies and bees, I should emphasize that these micro-windmills are VERY micro. Smitha Rao and J.-C. Chiao designed and built the device that is about 1.8 mm at its widest point. A single grain of rice could hold about 10 of these tiny windmills. However, you probably wouldn't want to put these micro-windmills on a grain of rice. Hundreds of the windmills could be embedded in a sleeve for a cell phone. Wind, created by waving the cell phone in air or holding it up to an open window on a windy day, would generate the electricity that could be collected by the cell phone’s battery. For more information, see the website for the University of Texas at Arlington's partner, WinMEMS. While this technology could potentially be commercialized, I suspect that we'll all look pretty silly if we're all waving our cell phones in the air (like we just don't care) just to keep them powered. I've covered this before, but it bears repeating. The protections in the U.S. Constitution's Bill of Rights are designed to protect you from GOVERNMENT intrusion. Those amendments, in and of themselves, do not apply to non-government agencies. So, unless other legislation is on the books, a private company cannot "rob you of your First Amendment rights" or "Second Amendment rights" or whatever. The Los Angeles Times' David Lazarus reminded us of this in the recent brouhaha about Capital One. For those who haven't heard, Capital One's new contract terms state that Capital One may choose to contact you via a personal visit "at your home and at your place of employment." And no, this is not a Fourth Amendment issue. So while an overzealous Capital One employee could break other laws, such as harrassment and stalking laws, the Fourth Amendment itself is not an issue. I have always maintained that the government picks losers first, and the last bidder left standing is the winner in the source selection process. While the selection methodology that he describes may not necessarily fit when there are only a few bidders, the observation remains accurate. Of course, Lohfeld then goes on to suggest how to keep yourself from being added to the losers piles. So SodaStream tried to say that Coca-Cola and Pepsi were irrelevant, but the Illuminati - I mean Fox - blocked the four-word statement. Then Coca-Cola fired back by reaching an agreement with a SodaStream competitor. But now, according to an AP article that I cannot quote, Coca-Cola is less profitable. Incidentally, I have found SodaStream mixes that only contain sugar, and none of the fake stuff. Documents issued to bidders in late December, with a response date in early January, with the added fun that clarification questions couldn’t be answered until a couple of days before proposals were due in “because everyone’s on holiday”. Swipe and Crush - it's all fun and games, isn't it? Also see coverage from tickld and Huffington Post, and an open letter from the Candy Crush Saga people on a different issue. I'd also share Brian Hartman's assessment, but this is a family blog. Marketers say marketing is important. Sanitary engineers say sanitary engineering is important. If you work in industry X, and if you write something that says that industry X is very important, it should be no surprise that others in industry X think that you're a genius. So I guess it's appropriate to disclose that I consider myself a marketer, and that Kevin P. Young is in charge of the go-to-market strategy for Lohfeld Consulting Group. Therefore, it shouldn't be a surprise that Young started a post with a relevant quote from Peter Drucker, or that I liked the quote in question. It is fair to say that this view is not universal, as Young acknowledges. I obviously am not trendy, because TechCrunch was writing about this last November, noting that Pegman has been around for a while, and that he has gotten more conservative over time. Just like in the old Google Maps, you can now drag and drop the Google Maps Pegman onto any road again and bring up Street View. The only difference is that Pegman now lives in the bottom right corner of Google Maps and not the top left. 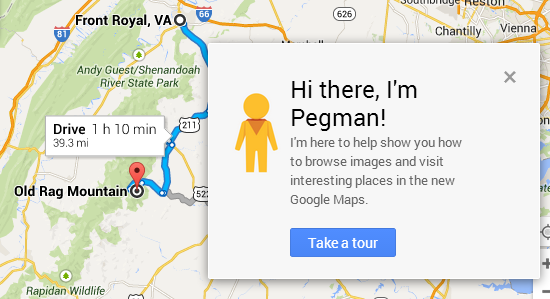 However, this is the first time that I can recall Pegman interacting with me in a Clippy-like way. And since this is Google, can we expect Pegman to pop up in all Google products? Will Pegman provide battle tips in Ingress? Introduce YouTube videos? Hawk Motorola phones? Normally, when two sides face off in a business dispute and rally their supporters, the predictions of dire consequences prove to be unfounded. One possible exception may be the dispute between DirecTV and the Weather Channel, but for all I know, that may be resolved at some point. And maybe the dispute between the "Los Angeles Angels of Anaheim" and the City of Anaheim may also be resolved. Angels owner Arte Moreno said Friday that negotiations with the city of Anaheim for a new stadium lease are “at a stalemate,” but he stopped short of saying he was aggressively pursuing a new home for the team. Well, if "partnership" is defined as "giving the parking lot to Rita Moreno of Arte," then yes, Anaheim mayor Tom Tait isn't interested in "partnership." There's only one teeny tiny problem - there aren't a lot of 50,000 seat baseball stadiums sitting around Los Angeles. (The Coliseum doesn't count.) Of course, Rita Moreno of Arte can hope that an Irwindale will be motivated to throw a bunch of money Rita's way to build a stadium. These certainly aren't the days of Gene Autry. Two important disclosures need to be made at the outset of this post. The first one, which is especially important, is that my employer competes with 3M. I want to make you aware of this, because this competition may, um, color what I am about to say. Kool understands the vibrant urban world of the trendsetting, multicultural smoker. Which brings us to 3M's latest press release - entitled "Fashion Expert and Stylist Brad Goreski Introduces Colors of the World Collection by Post-it Brand." 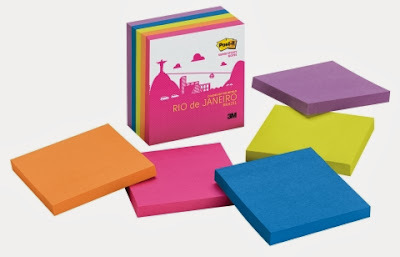 In normal person terms, this means that Post-It is available in some special color packs. But hold on, because that isn't how fashion experts say it. Modern, adventurous, authentic and expressive, the Post-it Brand Colors of the World collection embodies the quintessential spirit of four exciting regions with a vibrant display of colors that mirrors the style and culture of the locations they are inspired by. The array of colors is as diverse as each of the four destinations, ranging from eye-catching bright hues to carefree contemporary shades. So, when you next go to your WalMart, you will be able to acquire Goreski's interpretations of New York, Bangkok, Mykonos, and Rio de Janeiro. I have never been to Bangkok or Mykonos, but I have been to the other two cities, and I was especially looking forward to the modern, adventurous, authentic, and expressive way in which Rio was portrayed. Color me...underwhelmed. After all of this marketing build-up, I expected something so chic that Kim Kardashian would not be allowed to purchase it. However, it looks like this could be purchased by...ugh...people who work in cubicles. While I don't agree with it, I can understand why people have the urge to be marketing free. An over-the-top marketing campaign usually leads to disappointment at the end (a notable exception was ALF, which had a huge marketing campaign, but actually succeeded on the air for several years). I'm glad that I never do anything that's over the top. That would be embarrassing. Perhaps this is a game change, but based upon the wording of UCLA's article, it's not a permanent game change. Author Matthew Chin carefully noted that the reverse-engineering effort would take hundreds of years "on today's computers." Twenty years from now, you might be able to perform the reverse-engineering in minutes. Mark Traphagen mentioned the "Hemingway app" at www.hemingwayapp.com. I figured I'd give it a test by entering the first six paragraphs from this post, since I had written all six paragraphs in question (even the quoted material). 1 of 9 sentences are hard to read. 0 of 9 sentences are very hard to read. 0 adverbs. Aim for 2 or fewer. 3 uses of passive voice. Aim for 2 or fewer. Incidentally, the hard to read sentence was "Since there will be a limited number of commercials, they can sell for $25 million apiece, and the broadcaster will make a fortune." P.S. Yes, Mark Feenstra pasted Hemingway into the Hemingway app. I propose that we scrap the current coverage of the Super Bowl, and that next year we just show a one hour special on Monday night. This will provide time to edit the Super Bowl into a compelling story. Since there will be a limited number of commercials, they can sell for $25 million apiece, and the broadcaster will make a fortune. And if the Patriots make the Super Bowl, ten minutes of that hour can be spent on an up close and personal look at Gisele Bündchen. Win-win for all, isn't it? But if you're paying attention, you also know that my views are in the minority. BleacherReport.com had a large Olympics presence, but the users didn't seem to care much. A post about the 20 biggest moments in U.S. ice-skating history had 1,500 views and no comments. That compared with a piece about the top 25 college football recruiting classes, which boasted nearly 500,000 views and 500 comments. For better or worse, NBC knows its American audience. I do not claim to be a perfect writer - my writings are not always of the highest qualtiy. But I cannot recall making so many errors in three short paragraphs. This screen shot shows how this USA Today article appeared at 8:45 pm Pacific time this evening. This raises the question - when Brokaw held the wedding reception for his second marriage (the one to "Merideth," following his earlier marriage to the Berlin Wall), but the couple serve Rits crackers? P.S. While reviewing this post one more time, I discovered the "granchild" error. This is why my boss has instituted a QA process for all proposals. P.P.S. Here's the subsequently edited version, as of 8:55 pm Eastern time. I suspect that USA Today was rushing to get the story out, and rushed a little too quickly. If you're reading this, you presumably found it on the World Wide Web. (I haven't taken to posting paper copies of my writing on telephone poles.) You are using the World Wide Web to amass information. This sounds good, assuming that the information is worthwhile. But is this a good thing? In the internet era, where we have access to a diversity of information, many pundits say humankind will learn to make more informed decisions. Whereas others suggest having so much information at our fingertips will limit our ability for concentration, contemplation and reflection. The scientists compared how well the volunteers faired in the three consecutive questions to see if the volunteers were actually getting better at figuring out the problems themselves or just at copying the right answers. They found that there was no improvement from one question to the next; even when individuals had realised in the first round of questions that finding the solutions required deeper thought, in the next question they were back at square one. In the course of writing a post that will appear in my Empoprise-MU music blog, I had occasion to visit the website of the British Basketball League. When I got there, I focused on one team - the Birmingham Knights. Why the Knights? Because, in the 2013-2014 season, they have yet to win a game. There happens to be a reason for this apparent futility. This is the first season for the Birmingham Knights. And the Knights clearly have their fans.
.@BhamKnights looking stronger and stronger every game, surely won't be long 'till their first #theBBL win? “We have to remember that BBL Basketball is back in Birmingham, so it’s much more than results on the court that will define the season. “It’s about building the fan base, developing the game in the city and building solid foundations for the future. The players also deserve credit, according to Douglas. Biofuels. People have created them from household waste, algae, and watermelon. But, at least in the United States, the most popular source of biofuels is good old corn. Because the algae and household waste biofuels creators aren't good at lobbying for subsidies. As a result, people put ethanol in their cars. And they put high fructose corn syrup - I mean corn sugar - into their drinks. As you can tell from the links, I've written about biofuels a lot over the last few years. But there's one thing in common for most of the biofuels I've written about - most of them require a lot of space be devoted to the creation of the raw materials for the fuel. You have to plant a lot of corn, or watermelon, to create any appreciable amount of fuel. Even the algae solution requires a mass of algae that is the size of a small country. While the debate over using crops for fuel continues, scientists are now reporting a new, fast approach to develop biofuel in a way that doesn’t require removing valuable farmland from the food production chain. Their work examining the fuel-producing potential of Streptomyces, a soil bacterium known for making antibiotics, appears in ACS’ The Journal of Physical Chemistry Letters. The method also could help researchers identify other microbes that could be novel potential fuel sources. Sounds good - but doesn't this also sound like the plot of a horror movie? Three updates to my January 28 post. First, the Sodastream ad DID air during the Super Bowl, with the four offending words ("Sorry, Coke and Pepsi") removed. Second, it turns out that Keurig is developing a device called the Keurig Cold, which will be available in 2015. Coca-Cola and Green Mountain Coffee delivered a crushing blow to SodaStream Wednesday. However, this doesn't address the concerns that I raised in my January 28 post - unless Green Mountain has a Mexican subsidiary that will release capsules for sugar-sweetened Coca-Cola (rather than the high fructose corn syrup version that we get in this country). Switch, a privately held company based out of Enterprise, Nevada, is a provider of these services through its SuperNAPs – high-density data centers located in Las Vegas – and it has announced today that Suprema’s BioEntry Plus technology will be further securing the mega-hubs. I should provide the relevant DISCLOSURE that Suprema is a competitor of my employer. However, that isn't why the sentence caught my eye. What caught my eye was the use of the term "SuperNAP." Is this a power nap, designed to mitigate the effects of Gray's maxim "sleep is unproductive and a waste of time"? Or is this a Rip Van Winkle type of twenty year nap? And who sleeps in Vegas, anyway? As those more technical than me realize, "NAP" is an acronym for Network Access Point - something that you'd expect a company like Switch to provide. But why is the SuperNAP so super? Yes, you just read "100% uptime." Again, the technical folks realize that you don't bandy phrase like "100% uptime" around haphazardly. Even five-nines availability is difficult to achieve, and blogger accuracy is much lower than that. Five nines of availability doesn't impress Roy. "We give 100% service-level agreements, guaranteed," he says. "Obviously, that's a big monetary risk if I didn't feel this design was ready for that. Our NAP 4 facility, which is our next biggest site [and also in Las Vegas], for three years has had 100% uptime." The SuperNAP (network access point) operates its own 250 megavolts ampere (MVA) substation, 146 MVA of generator capacity and 84 MVA of UPS (uninterruptable power supply), topped off with 30,000 tons of redundant cooling. "Our network for six years has never had an outage," Roy says. "Every single part of it fails. In any given month, something fails. Blades fail, Cisco routers fail, carriers fail, Sprint fails, Verizon fails, AT&T fails. But we build this stuff in such a redundant manner. The chance of something happening with us where you have an outage is really less than anywhere from a design standpoint." And if the SuperNAP isn't good enough for you, the MEGANAP (NAP9) is coming. No system can prevent 100% of fraudulent activity, and online banking is clearly subject to fraud. According to this 2010 article, businessman Fan Bao and businesswoman Cathy Huang found this out the hard way. Their bank, Bank of America, noticed two unusual wire transactions to Croatia, but Huang was out of the country and Bao was not an "authorized agent" on the bank account. By the time Huang was able to reach the bank, the first of the two transactions - for $50,000 - had already gone through. As far as the bank was concerned, that money was lost. But wait a minute, you say. Aren't people only liable for $50 in fraudulent charges? But since the fraud was committed on the corporate account of ZICO USA, Bao and Huang were forced to prove in court that the fraud WAS committed on the bank's end. The bank required the couple to prove that their own computer hadn't been hacked. I wasn't able to discover how the lawsuit was resolved, but I wonder if Bao and Huang are all that excited about online banking any more. The couple claimed that Bank of America encouraged them to bank online, saying that it was safe. The stablehand wasn't sure how to react to the woman standing in front of him. She had opened the gate and drove her SUV straight up to the stables. She was clearly excited about something. "I hope you can," she responded. "I guess this sounds a bit unusual, but..."
"...but I was so moved by what I saw on TV yesterday that I just had to do this. I guess you watched the Super Bowl, sir." The stablehand didn't know where this conversation was going. "Uh...yeah," he replied. "Well, I saw that one commercial...you know, the one with the horses that was aired by that beer company?" "I don't think I saw that," said the stablehand. "I must have gone to the can - I mean, stepped away from the TV." "Oh, you missed a wonderful commercial, sir," she responded. "The horses were absolutely beautiful, and it was the most moving thing that I've ever seen on TV. And that's why I have...my request." She lifted up the small cooler that she was carrying. "Sir, I would like to drink beer with a horse." "Uh, I'm sorry, ma'am, but my boss doesn't let the horses have alcohol." "No, I didn't mean that. I just wanted to drink this beer" - she again lifted the cooler - "in the presence of a horse." "Well, I'd have to get the boss' approval, and he's in town right now." The woman reached into her purse. "A hundred bucks for a half hour with a horse." The stablehand looked around. "Well, OK. But make it quick." "Oh, yes..." the woman sighed to herself. "My dream come true." So the stablehand led the woman, still carrying her cooler, up to the stables on the top of the hill. He waited at the door, mystified by the woman's look of exhilaration. She reached to open the door, but he stopped her. "Um, ma'am," he reminded her. "One hundred." "Oh, yes, I'm sorry," she replied, handing him five twenty dollar bills. He then opened the door. "One half hour," he told her. "If I knock on the door, that means the boss is coming and that you have to scram. 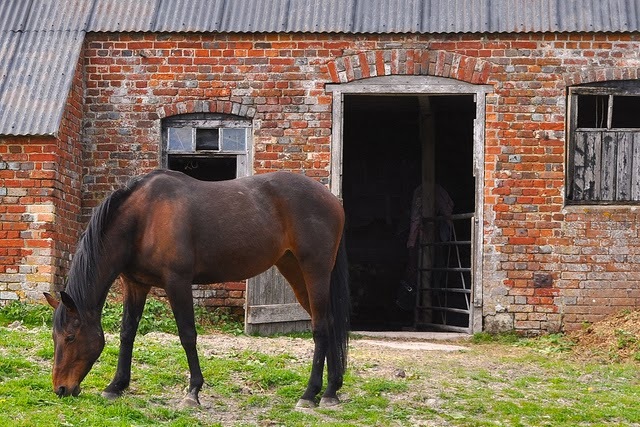 Don't leave any beer bottles in the stable, and don't try to ride the horses. And have fun." He closed the door behind her. Having nothing else to do, he stood by the door and listened. "Oh, it's dark in here...oh, it smells! But the horses are so beautiful...but that smell! Where can I sit? Oh, here's a box...Boy, this floor is muddy; you'd think that guy would clean the mud up. Ah, that's better. Open the cooler...and now - glad I brought a can - pop that. And now, a beer with the horses. Uh, this beer isn't so good. Kind of like carbonated water...and those horses smell! Ew, I can't finish this beer - WHAT'S THAT ON MY SHOES? THAT'S NOT MUD!" The stablehand pretended to be working when the woman stormed out of the stable. "Are you finished?" he asked. "Well, I'm certainly finished with this beer!" she angrily shouted. "Whenever I think of this beer again, I'll think of" - she paused - "HORSE POOPIES!" She stormed to her car, trying to clean her shoes on the ground as she did so. Meanwhile, in a boardroom far away, an advertising team was conducting a post-mortem on their most recent ad. "The ad was clearly an unqualified success," said the manager. "Hashtag use, likes, and shares all set new records." A junior assistant stood up. "But did we accomplish true engagement?" "Didn't you hear me?" replied the manager. "I said that hashtag use, likes, and shares were all up. "If that isn't true engagement, I don't know what is."